Note to readers: Pre-eBay, pre-Internet, pre- Planet Hollywood, positively prehistoric. Once upon a time you could buy celebrity-worn discards direct from a walk-in store. That's what this clotheshorse learned after happening upon A Star Is Worn in August 1990. Here's a story that that can still thread the needle. LOS ANGELES -- "You mean I can really buy something that belonged to Farrah Fawcett? Those are her pants?" Fred Howe, store manager of A Star Is Worn, says that's a typical reaction from tourists looking to develop something of a skin-tight relationship with their favorite celebrity. Local shoppers at Hollywood's answer to Goodwill are a bit more pragmatic. "They're not so much concerned with who wore it, but if it's a good deal or if it's a trendy piece," Howe says. "They figure that somebody's already done their shopping for them." The store was founded four years ago by Sonny Bono's lesser-known former wife, Suzie Coelho. She had become good pals with Cher, Bono's most prominent ex-. The two women thought it would make sense to sell their used duds to commoners. They encouraged other stars to do likewise. Explains Howe, "Cher buys lots and lots of stuff. It's very expensive, and she only has X-amount of closet space. So it really is just a matter of logistics." Cher, whose used clothes are always in high demand, has "such a close relationship" with designer Bob Mackie, Howe says. "I mean, he even customized her sweatpants. It's incredible." Cher tends to discard clothes as if they were paper towels. Lots of stars are that way. "They're so much in the public eye that they don't want to be seen in the same thing too often," Howe says. "I don't think it's good PR for them." Profits from sales are divided three ways, he says. A Star Is Worn gets a cut, as does the star. A donation also is made to the star's favorite charity. Howe won't name the percentages or the charities, but says the authenticity of the clothing is verified either through the stars themselves or their "personal assistants." "When it actually comes to cleaning out the closet, though, they don't let the personal assistant do that," Howe says. "They do it themselves." Imagine Cher thumbing through her glitter gowns and various see-through pants. "Yuck, they got you, babe." A Star Is Worn doesn't "discriminate" against fading stars, but sometimes you've gotta draw the line, Howe says. "If a celebrity came in and just gave us things that were all ripped and torn and stained, we'd politely say that we couldn't take those things. We like to have things that are in good condition." For $600 you can buy a collection of four shirts worn by James Garner in the movie Sunset. Beneath the Sunset display is a rack full of Stevie Wonder's shirts, sweaters and pants priced to move at $35 to $50 apiece. But the store stocks mostly women's clothing. Gowns, sweaters, blouses, leisure wear. Even a "black reptile" bustier worn by Lisa Hartman and available for a scant $110. "Men just aren't the same with their clothes as women," Howe says. "Women will go out and buy a $2,000 gown, wear it once and then don't want to be seen in it again. A man will go out and buy a tux and keep it for 10 years." 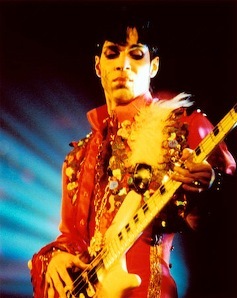 The most expensive item in the store on this day is a glittery waiter's jacket worn by Prince on his Purple Rain tour. Seven thousand dollars -- and cheap at the price. "Prince is very legendary," Howe says. Those with less legendary budgets might want to opt for a plastic guitar pick with "Prince" printed on it. Only $195. Other eyecatchers include a slinky black gown worn by Cybill Shepherd on Moonlighting ("a steal at $2,000"); a sleevless, red cotton dress filed out by Catherine Bach on The Dukes of Hazzard ($145) and a Farrah wool tube skirt ($65). There's also a decidedly unglamorous bargain rack, where shoppers can take 50 percent off the marked price. A strikingly shabby tennis shirt worn by Victoria Principal is only $10. Or how about a Heather (The Fall Guy) Thomas sweater vest for the low, low price of $50? Howe says the store may get a costume Madonna wore both on tour and on the cover of Rolling Stone. Besides that, it was created by a really trendy designer. "That's a great threefold combination," he says. "A very salable, high-end piece." Or maybe you'd rather have a Mindy (The Facts of Life) Cohn tank top. Only $12.50. And probably available anytime. 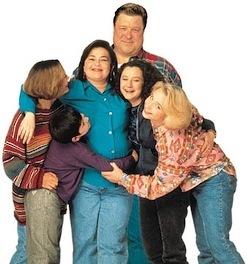 A first-season cast picture from Roseanne and today's version. Note to readers: If asked, she'll serve. Roseanne Barr recently said she'd love to replace Rosie O'Donnell as The View's resident loudmouth. Her career could use a lift after the quick cancellations in recent years of a late night talk show and a prime-time reality series. She once knew the glory of Roseanne, though. It premiered on ABC in fall 1988 and spent seven consecutive seasons in prime-time's top 10. This article, from August 8, 1988, recounts Barr's official introduction to television critics at that summer's network TV "press tour." LOS ANGELES -- A handful of TV critics are Barr-hopping, hoping to flesh out a better story on an admittedly flabby, coarse comedian whose Roseanne sitcom is a good bet to be the highest-rated new series of the season. 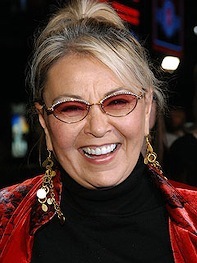 In one interview session at a local hotel, Roseanne Barr briefly lapses into poignancy in recalling how her father, a Sears parts salesman, told a People magazine writer that he'd always wanted to be a standup comic. "It was the first time I'd heard that," she says. "Everything in my life suddenly made sense. My dad really turned me into this person." Later, facing a different batch of critics, she blurts out a typical broadside: "You ever notice that all (expletives) have the same job -- boss? It just seems to be the way it works out." Barr, the self-proclaimed "domestic goddess" and previous holder of "every minimum wage job in the world," is playing a combination mom/plastics factory worker in a new ABC comedy comfortably scheduled between Who's the Boss? and Moonlighting on Tuesday nights. The series was developed by Tom Werner and Marcy Carsey, former ABC programming executives who created The Cosby Show for NBC. The Carsey-Werner Company's independent agreement with the Writers Guild of America, signed long before the strike ended, enables Roseanne to begin production this week with a backlog of scripts. Barr weaned her standup comedy in Denver punk and biker bars before coming to Los Angeles in 1984 and scoring on The Tonight Show. The exposure led to an 18-week job as an opening act for singer Julio Iglesias. Last year she starred in an HBO special titled On Location: The Roseanne Barr Show. Barr says her ABC series is "real autobiographical," as is Cosby. As in real life, she'll have three children and a husband to bounce around verbally but not brutally. Her TV husband, Dan, played by John Goodman, is not nearly the slob she's been savaging in her nightclub act. "I never thought that I was bashing my husband in my act either," Barr says. "I just thought it was my point of view on my marriage. but I mean, yeah, the guy's three-dimensional now. He's a real guy." Barr has been married for 16 years to Bill Barr, whom she describes as "the funniest person I ever knew in my whole life. He doesn't have any respect for anything. And he's very much an anarchist." Roseanne and Bill met in "the mountains of Colorado" and "were real hippie people" living communally, she says. together they mapped out her comedy routines and made babies in a 600-square foot home-not-so-sweet home. Their new Los Angeles residence, purchased a year ago, is kept in working order by a newly hired maid. "I don't like the idea that it's real romantic to be poor and work yourself to death for little or next to nothing," Barr says. "My father always used to say, 'It's better to be rich and healthy than poor and sick.' "
Roseanne and her siblings -- she has two sisters and a brother -- were raised in Salt Lake City, where "we used to get beat up a lot," she recalls. "You know, all that real-life stuff. I call all those people the Nazi Amish." She says this almost jokingly but leaves no doubt that anti-Semitism scarred her childhood and left her both tough-minded and insecure. Her husband, of whom she speaks glowingly, was something of a savior. He'll have a recurring role on Roseanne as her TV husband's best friend. Barr says she intends to play "this nice lady that's funny and has an edge. that's how I see myself. "I love Carol Burnett because she's just so real and she seems like your neighbor and somebody you'd like to know. I liked Lucy, but I hated her show because she has to beg her husband for five bucks and he hates and all that (expletive)." When The Honeymooners is mentioned, Barr exclaims, "Ooh, that's my favorite show in the world!" As a kid, she did Jackie Gleason impressions after watching Ralph and Alice Kramden (Gleason and Audrey Meadows) fight and make up each week. "It didn't seem mean with Alice and Ralph," she says, "because you know they love each other and they're just picking at each other." The childless Alice, she says, would be a "damn good mom." Mothering her three real-life children -- ages 12, 12 and 11 -- is easier, she says, now that they have their own interests and don't care to be around her that much. The family occasionally gathers in the mid-afternoons, however, to watch Donahue, Geraldo!, The Oprah Winfrey Show, etc. "I don't understand those shows at all, but I have to watch them. I have to," she says. "what else am I gonna do at three in the afternoon? Exercise? I'm just a real private kind of family kind of a gal. I'd just rather stay at home and have a beer and stare at TV." The children, she says, are sick of hearing her talk about her new show. But Barr says she never tires of watching herself in action. "I swear to God, I am my hugest fan," she says in her coarsely charming way. "I think I'm really funny."